The issue begins as Alicia debuts her latest work, a life-size statue of the Thing, while Reed and Sue read a newspaper article about the X-Men, amazed that the young heroes have become famous in so short a time. Elsewhere, Alicia’s father, the sinister Puppet Master, walks through a door into the laboratory of the Mad Thinker, here still referred to as just “the Thinker.” So this isn’t just a superhero team-up story, but it’s a villain team-up as well. We’re also reunited with the Thinker’s Awesome Android, with a reminder that Reed invented the Android, only to be stolen by the Thinker. The Thinker has (of course) an evil plan in the works. He tasks the Puppet Master to creating one of his radioactive mind-controlling puppets in the form of Professor X, mentor the X-Men. The prof resists, so P.M. makes a stronger puppet, and this time it works. The professor summons the X-Men. 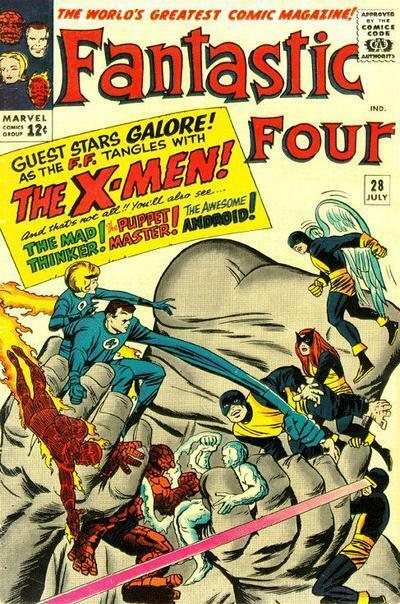 It’s the original five – Cyclops, Angel, Beast, Iceman, and Jean Grey as Marvel Girl. This was during the time that Jean wore that weird mask with the pointy tips on the ends. The professor tells them to go and attack the FF. The X-Men don’t understand why, but they do as the tprof. asks. In their helicopter (the X-Men have a helicopter? ), the X-Men arrive at the Baxter Building under the pretense of a friendly visit, only to attack once inside Reed’s lab. We then get several pages of fighting, as each FFer and X-Man shows off his or her powers. It ends with the FF defeated, locked away inside one room in their HQ. The X-Men take Sue hostage (sigh…) and depart. Reed, Ben and Johnny regroup, and head out in pursuit of the X-Men. Along the way, there’s an interesting bit of business where Ben jokes about the Beast’s eloquent vocabulary, and Reed says, “You don’t fool us, Ben! You hold a college degree or two yourself!” Ben seems embarrassed by this, and asks Reed not to spread this information around. 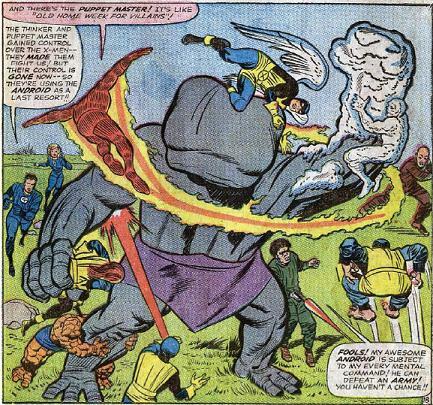 The X-Men land on a rocky plateau out in the middle of nowhere, with the FF right behind them. Another fight breaks out, this time with trap doors opening up beneath them, as high-tech devices inside them help capture the FF. The Thinker and the Puppet Master emerge from hiding underground. The X-Men want no part of this, but P.M. uses Professor X’s telepathy to put them all asleep. (Why didn’t he do this to begin with?) The Beast, however, has enough mental wherewithal to stay awake long enough to crush the Professor X puppet under one of his huge, ugly feet. The FF fight their way back to the surface and free Sue, just in time for the Awesome Android to attack . (“It’s like Old Home Week for villains!” Johnny says.) The Android puts up a good fight, mimicking Ben’s strength and Iceman’s, um, ice. Professor X then comes to and shuts the Android down telepathically. The Thinker and the Puppet Master escape, giving the old “Until next time” speech. Instead of pursuing, the FF and the X-Men shakes hands, departing as allies. Unstable molecule: Reed’s powers prove to be a match for Beast’s agility, as neither one gets the upper hand in the fight. Fade out: Sue is made a hostage yet again, and is defeated by Angel when all he does is grab ahold of her and fly around. Later, she keeps Marvel Girl out of the fight with a force field. 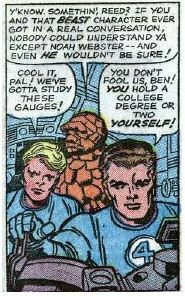 Clobberin’ Time: I still can’t get over this “Ben has a college degree or two” thing. We know Ben was a test pilot and former football star. What else don’t we know about him? Flame on: Johnny’s flames are no good against Cyclops’s optic blasts. He doesn’t do much else in this one. Trivia Time: This is actually not the first time the two teams have crossed over. 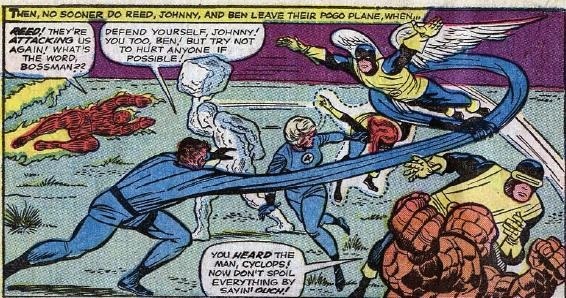 Johnny and Iceman already had a bit of a friendship/rivalry going on in the pages of Strange Tales, starting with issue #120. Many years later, Storm of the X-Men would become a full-fledged member of the FF. Fantastic or Frightful: The plot is your basic “heroes meet and fight under a misunderstanding” that’s been done a million times. The X-Men are here just enough to give a sense of their personalities and powers before they take off again. There are a lot of smaller moments that are interesting, but this is not a standout issue. Next week: It started WHERE?! ?